For the consumer that demands silence, the ASUS HR-0205T provides high definition playback, multi-functionality and an industry leading noise level. This new generation HD DVD ROM drive supports data from DVD+R/RW/DVD-R/RW formats, and is the quietest ODD available on the market, operating at a mere 21.1 dB  providing users with the best home HD movie playback entertainment experience. The HR-0205T supports 2.4X HD DVD ROM/2.4X HD DVD ROM(DL)/2.4X HD DVD-R Read, 5X DVD±R/ 5X DVD+RW/ 5X DVD-RW/ 5X DVD±R (DL), 15X CD-R/ 15X CD-RW; and 15X DVD-ROM/ 15X CD-ROM Read formats  giving the consumer maximum flexibility with support for nearly every type of disc media. HD DVDs come in two variations  single and double layer; and are equal to 4 hours or 8 hours of HD content respectively. The HR-0205T is capable of reading both single layer (15GB) and double layer (30GB) HD DVD-ROM media at 2.4x read speeds  allowing users to enjoy HD movie playback. HD DVDs also have much more capacity  about 3 times to 6 times more than ordinary DVDs. The HR-0205T is also able to transfer data at 10708.8 KB/s  7 times the speed of normal DVD data transfer rates. 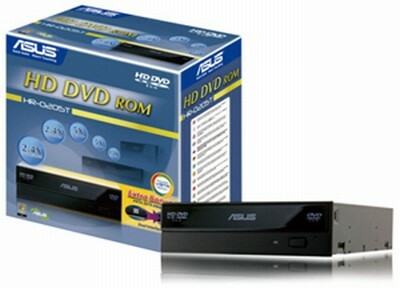 Another advantage of the HR-0205T is the fact that it takes full advantage of the shared physical structure of HD discs and standard DVD discs, which allows it to read HD-DVD-R, and in doing so allow users to read the diverse line-up of discs in the HD DVD-ROM disc family, including twin format disc and pick-up head with only a single objective lens. The HR-0205T also provides quiet operations for better movie enjoyment  operating at only 23.7dB for DVD-9 Movie Disc playback and 21.1dB for HD Movie Disc playback  much lower than leading competing models. The HR-0205T can utilize a PATA-SATA adaptor for high-speed and stable read capabilities with both SATA and PATA interface compatibilities, and can also be mounted horizontally or vertically. It also fully supports Windows XP/2000/ Vista  making for an easy and convenient installation. This entry was posted on August 12, 2008 at 9:56 am	and is filed under HD-DVD Drive. Tagged: HD-DVD Drive. You can follow any responses to this entry through the RSS 2.0 feed. You can leave a response, or trackback from your own site.